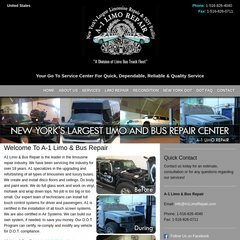 Topics: Us Dot Certified, New Number, Services, Limo Repair, Recondition, and New York Dot. Stafford Associates. Computer Specialists Inc. The programming language environment is ASP.NET. It is hosted by Stafford Associates. Computer Specialists Inc. New York, using Microsoft-IIS/5 web server. dns3.name-services.com, dns4.name-services.com, and dns5.name-services.com are some of its 5 Nameservers.